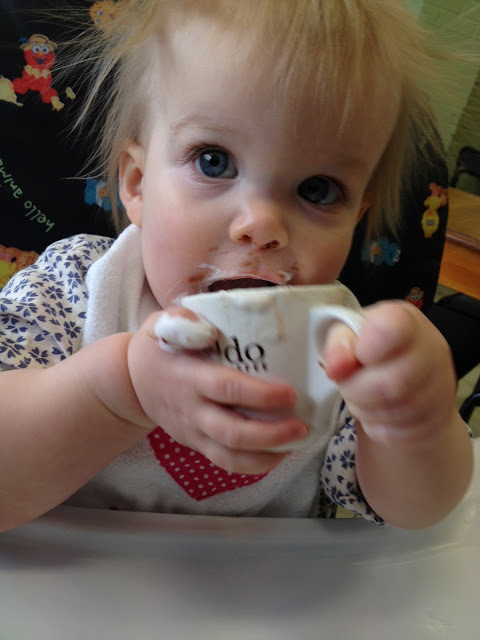 First baby chino! She LOVED it! Have a fabulous weekend everyone! We are having coffee with a friend tomorrow morning and then having lots of baby niece cuddles in the afternoon! Those eyes! Hope you have an amazing weekend. Ooooohhh! We haven't gone there with Georgie yet! I am far too afraid... Abi looks like she absolutely loves it though!! And her eyes are absolutely divine. She has the look of a little Oliver: "please sir, may I have some more...?" Hehe I can't wait to cross this one of my list! Abi looks like she has a new favourite drink!